The Japan consumer electonics giant, Panasonic has announced a new addition to its Lumix family of high-performance point-and-shoot compact digital cameras – the sleek, slim and stylish Lumix DMC-FX100 with HD video recording capability. The Lumix FX100 which is able to snap eight frames per second features a high-resolution 12.2 megapixel with 1/1.72-inch large CCD, 3.6x optical zoom, 2.5 inch LCD screen display, 28mm wide-angle Leica DC lens, intelligent ISO control up to ISO 6400 and Mega O.I.S (Optical Image Stabilizer) that helps eliminate blurring due to hand-shake. This amazing camera even records WVGA (848 x 480) video at 30 (fps) frames per second or 1280 x 720 at 15 fps direct to SDHC/SD cards. 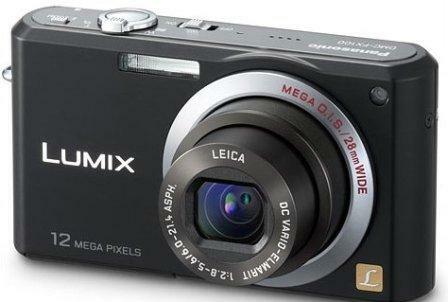 Besides, the Panasonic Lumix FX100 also incorporates the Venus Engine III processor, Panasonic’s advanced image-processing engine that helps render exquisite images with minimal noise. “Thanks in large part to the DMC-FX100’s newly developed exclusive LEICA DC lens and the high-quality, high-performance Venus Engine III, you no longer have to sacrifice power in a compact camera,” said Alex Fried, national marketing manager, Panasonic. In addition, the Lumix FX100’s shutter release is measured at 0.009 seconds while able to burst 8 shots per second at full resolution. Panasonic Lumix DMC-FX100 which comes with silver and black colors will be available in coming July but no words on its price yet.